Tennis For All were invited to work with Special Olympics City of York (SOCOY) in April of 2014. Special Olympics Great Britain was established in 1978 and is a registered charity. They provide training and competition in 26 sports. We started tennis sessions in Rowntree Park for people with Learning Disabilities later that month. We are open to all who qualify as having a Learning Disability. Whilst we have very competitive players the emphasis is still on having fun in the sessions as well as reaching the players full tennis potential. We have also formed links with Val French and the North Yorkshire Disability Sport Steering Group to enable us to work with both primary and secondary Special Schools in York and North Yorkshire. 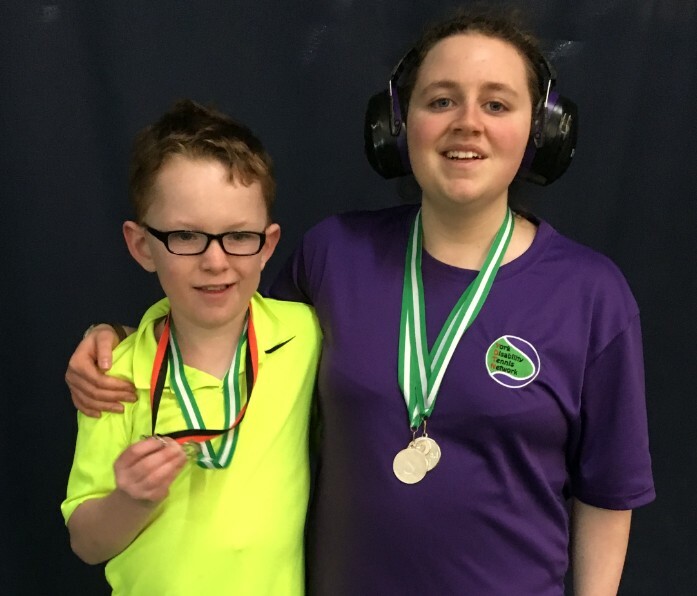 Congratulations to Naomi Foster and Sam Dale who took part in the Bromley Regional Learning Disability Tournament on 16th and 17th March 2019. Naomi won SIlver in the Singles and Sam was 4th and together they won Silver in the Doubles. Well done to you both! 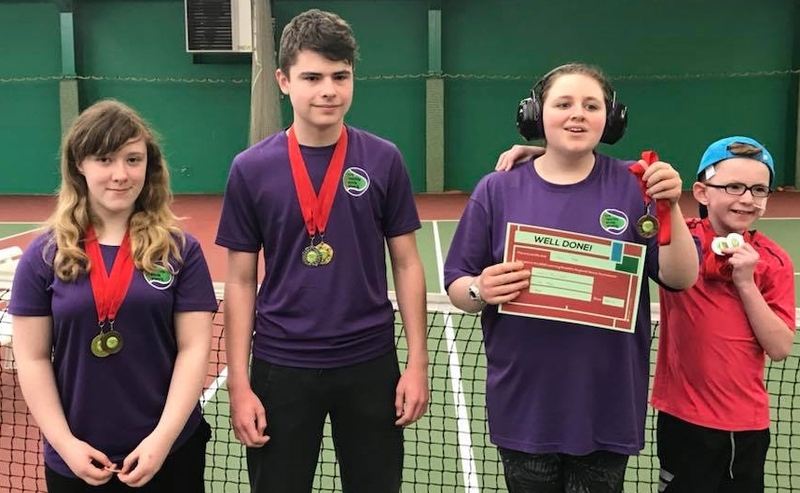 On 16th and 17th February 2019 York hosted it’s first Regional Learning Disability Tennis Tournament at David Lloyd, York. 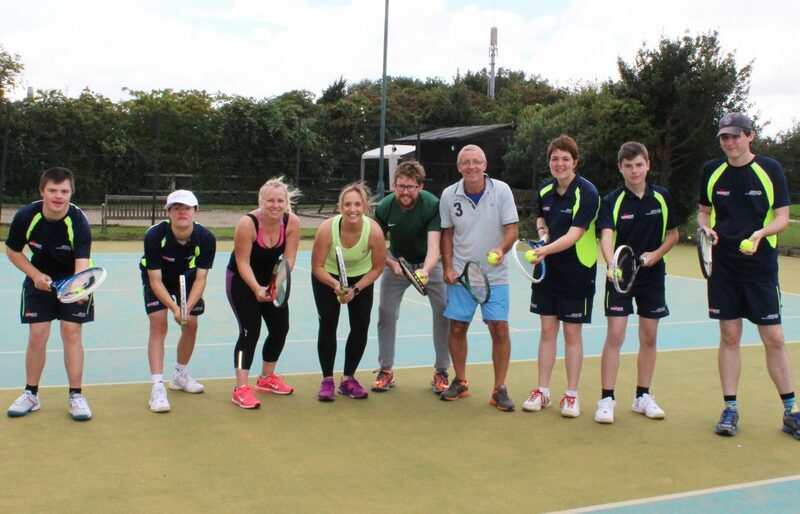 13 of our York Disability Tennis Network players took part, our biggest ever entry. Between them they achieved 6 Golds, 7 Silver and 7 Bronze medals. Pictured from left to right (back row) Cameron Long, William Farrow, Teresa Burfield, Naomi Foster, Lewis Brown, Laura Campbell and Keigan. (front row) Emily Clarke, Matthew Brough and Sam Dale. Not pictured are Maria Bruce, Samuel Nicholson and Daniel Fillingham. Special mention must go the Samuel and Daniel who were both playing in their first ever tennis tournament. Well done boys on a great performance. 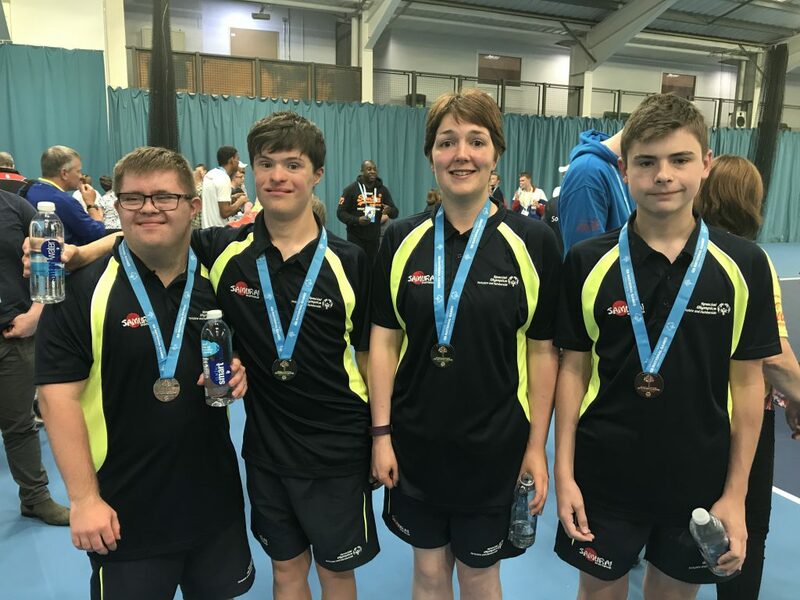 On 26th-28th October 2018 9 of our players took part in the Learning Disability National Tennis Championships at Nottingham Tennis Centre. They brought home 6 Gold, 4 Silver, 2 Bronze medals and 6 4th places between them. Special mention to our new National Champions Keigan, Matthew Brough and Naomi Foster in their respective divisions of the Singles competition and in the Doubles Keigan and Sam Dale and Teresa Burfield and her partner Frances Smiley from Scotland. Well done to you all. Pictured from left to right, Keigan, Sam Dale, Emily Clarke, William Farrow, Teresa Burfield, Matthew Brough, Naomi Foster, Cameron Long and Laura Campbell. On September 8th and 9th 2018 Naomi Foster, Keigan, Matthew Brough and Laura Campbell competed in the Glasgow Learning Disability Regional Tennis Tournament. In the Singles events it was Gold for Matthew and Keigan, Silver for Naomi and Bronze for Laura. In the doubles Naomi and Keigan partnered each other to win Gold. Matthew partnered Jack Dickson from Scotland to also win Gold in their division and Laura partnered Alistair Ramsey to gain fourth place in a very tough division. Well played all of you. 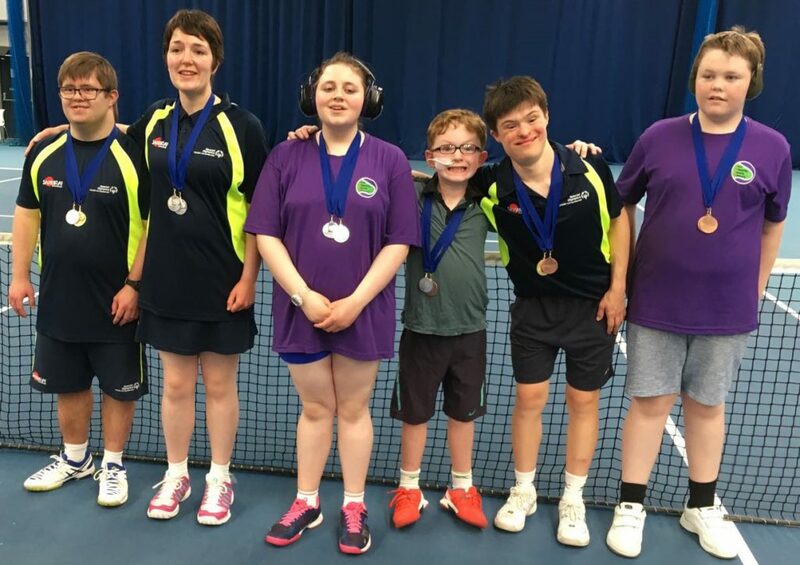 On July 28th and 29th 2018 Matthew, Sam, William, Naomi and Teresa competed in the Chesterfield Learning Disability Regional Series Tennis Tournament. Two Gold medals for Matthew Brough in both SIngles and Doubles (with good friend Jack Dickson from Scotland). Sam Dale won Singles Bronze and Doubles Silver with William Farrow who also won Silver in the Singles. Naomi Foster won Gold in the Singles and Bronze in the Doubles with Teresa who also won Silver in the Singles. Congratulations to you all. On 26th and 27th May 2018 seven of our York Disability Tennis Network players took part in the Learning Disability Regional Tennis Tournament held in Grantham. 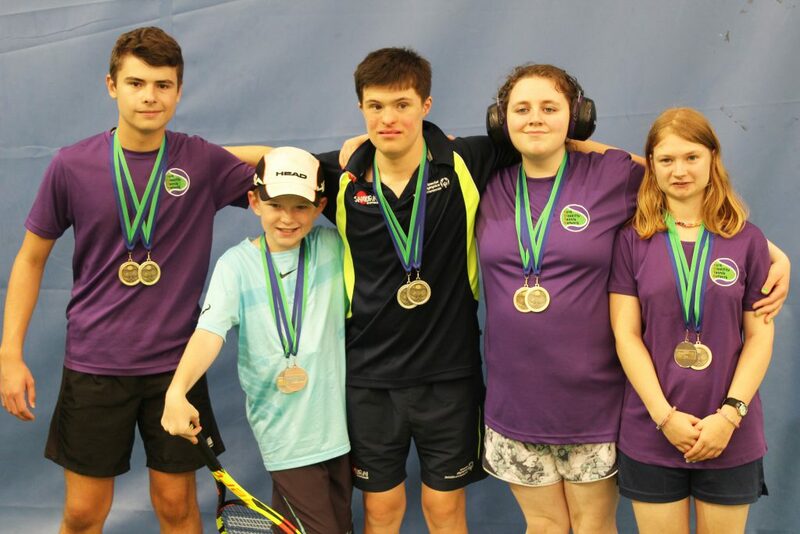 Pictured from left to right are Cameron Long (Bronze in the Singles and Gold in the Doubles with John from another region), Laura Campbell (Singles Silver and Doubles Silver with Haydn from another region), Naomi Foster (Singles Silver and Doubles Silver with Tom Sewell), Sam Dale (Singles Silver and Doubles Bronze with William), William Farrow (Singles Gold and Doubles Bronze with Sam) and Keigan playing in his very first tournament (Singles Bronze and Doubles Bronze with Maria). Not pictured is Maria Bruce (Singles fourth and Doubles Bronze with Keigan). Well done to you all. 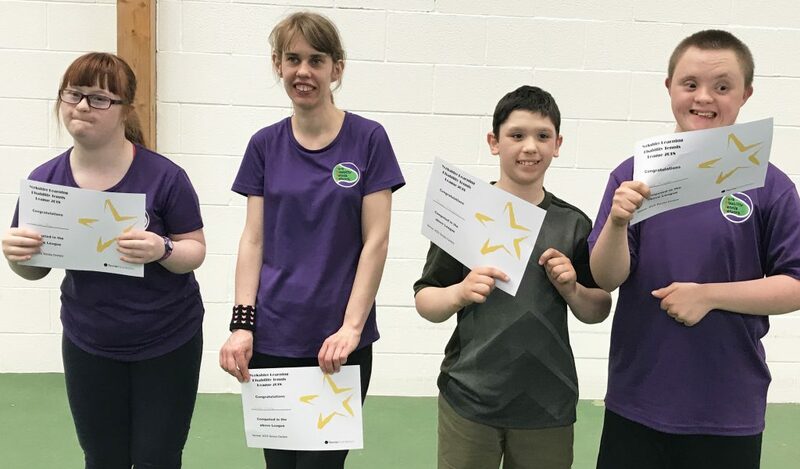 On 28th and 29th April 2018 Maria Bruce, Matthew Brough, Naomi Foster and Sam Dale competed in the Wrexham Learning Disability Regional Tournament. They all were amazing and played some fantastic tennis. Matthew Brough won Singles Silver and Doubles Gold, Maria Bruce won Singles Gold and Doubles Bronze, Sam Dale Singles Bronze and Doubles Silver and Naomi Foster Singles Bronze and 4th in the Doubles. Well done to you all. Well done to Jessica Pay, Emily Clarke, Daniel Fillingham and James Clayton for competing in the Yorkshire Learning Disability Tennis League on Sunday 22nd April 2018 at the John Charles Centre for Sport in Leeds. They all had so much fun and each came away with a certificate for taking part. Well done to you all! 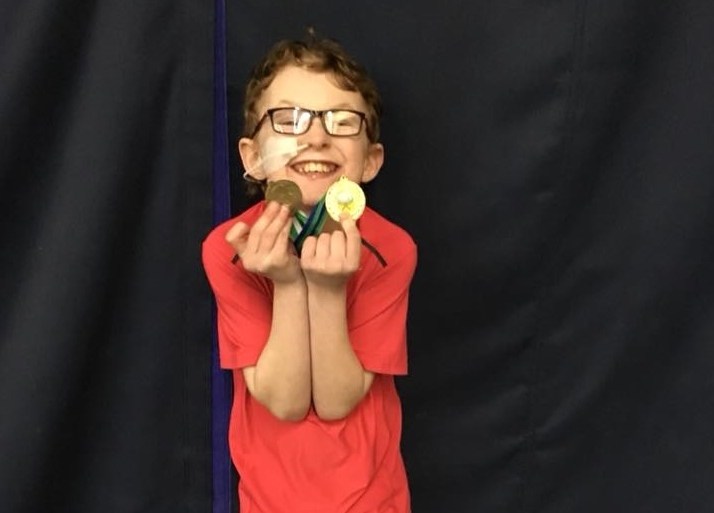 On March 10th and 11th 2018 Sam Dale competed in the Learning Disability Regional Series Tournament in Welwyn Garden City. Congratulations to Sam on getting a Bronze medal in the Mens Singles and a Gold medal in the Mens Doubles and all at the age of 10! Well done Sam! 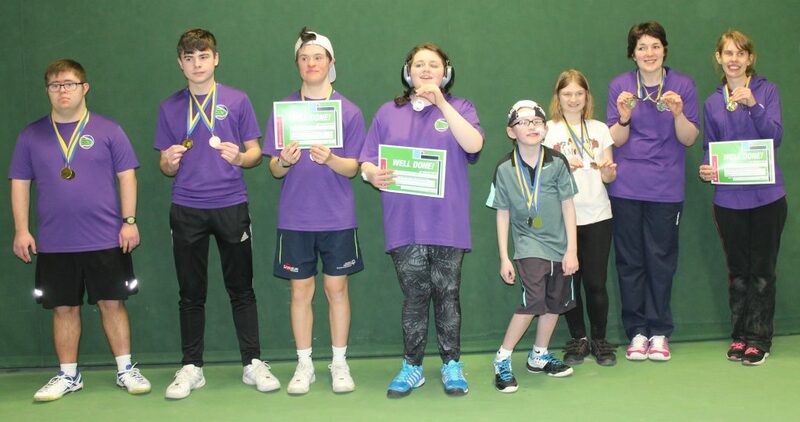 On 17th and 18th February 2018 nine of our players attended the Learning Disability Regional Tennis Series tournament held at the John Charles Centre for Sport in Leeds. 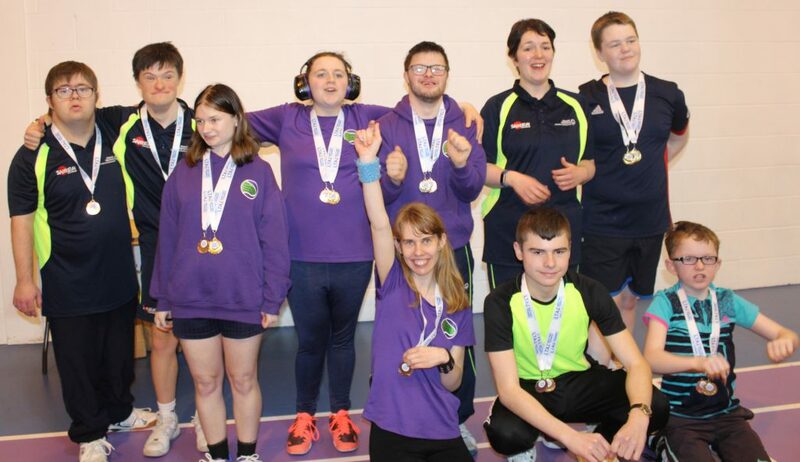 Pictured from left to right are Cameron Long (Singles Silver and Doubles Gold with Emily), Matthew Brough (Singles Gold and Doubles Bronze with Teresa), William Farrow (Singles Bronze and Doubles Fourth with Naomi), Naomi Foster (Singles Gold and Doubles Fourth with William), Sam Dale (Singles Silver and Doubles Silver with Dominic Hubner), Teresa Burfield (Singles Silver and Doubles Bronze with Matthew), Laura Campbell (Singles Silver and Doubles Silver with Haydn Furneaux) and Emily Clarke (Singles Fifth and Doubles Gold with Cameron). Lewis Brown (not pictured) came fourth in the Singles. Special mention must go to Emily, Naomi and Teresa who were playing in their very first tournament. Well done to you all! On the weekend of 27th-29th October 2017 four of our players competed in the Learning Disability National Championships in Nottingham. William Farrow won Gold in the Singles, Cameron Long and Matthew Brough Bronze and Laura Campbell Silver. 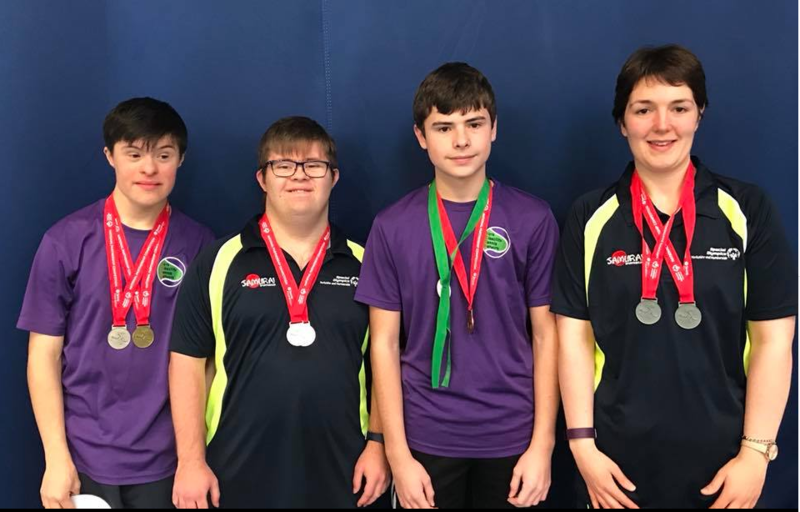 In the Mens Doubles William and Cameron partnered each other to win Silver, Matthew Brough came fourth with his partner from another region and Laura Campbell won a Silver medal in the Mixed Doubles again with a partner from another region. Congratulations to you all. 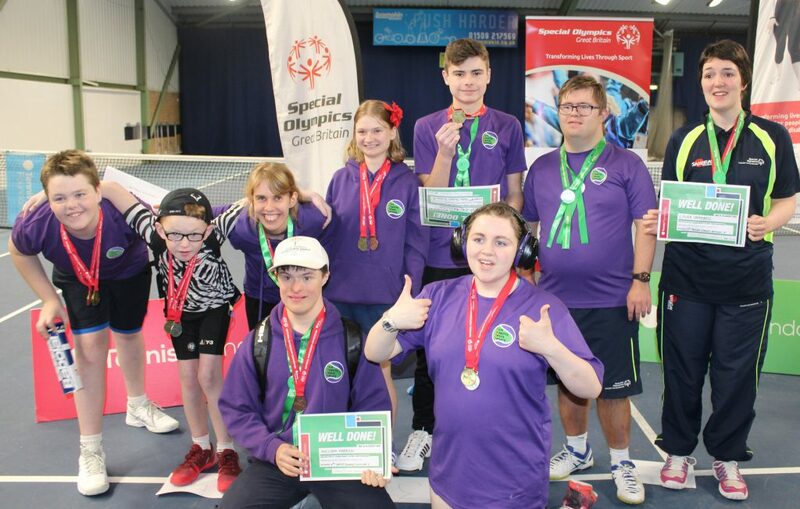 In August 2017 our athletes who attended the Special Olympics National Games challenged Kay Crewdson and a team from Radio York to a challenge tennis match. Great fun was had by all! Pictured after the match are YDTN players Lewis Brown and William Farrow, Sarah, Kay, Adam and Adam from Radio York and YDTN players Laura Campbell, Matthew Brough and Christopher Cook. From 7th-11th August 2017 four of our players participated in the Special Olympics National Games in Sheffield. The Opening Ceremony took place at Sheffield United’s football ground and was a great occasion despite the rain! 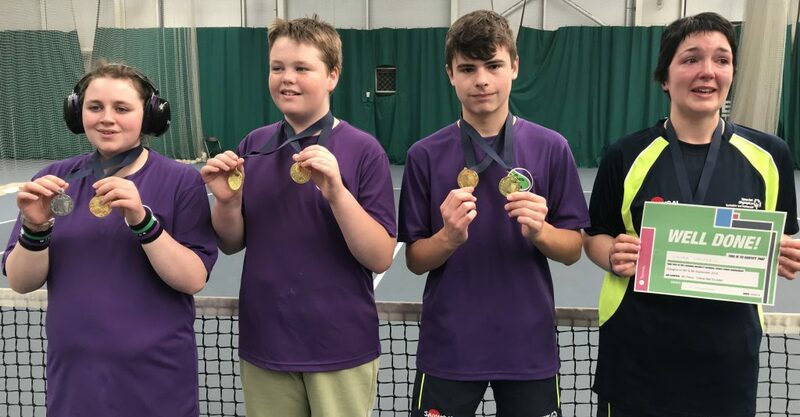 The tennis competition took place over four days and our players Cameron Long, William Farrow, Laura Campbell and Matthew Brough were representing the Yorkshire and Humberside region and came away with an impressive medal haul. 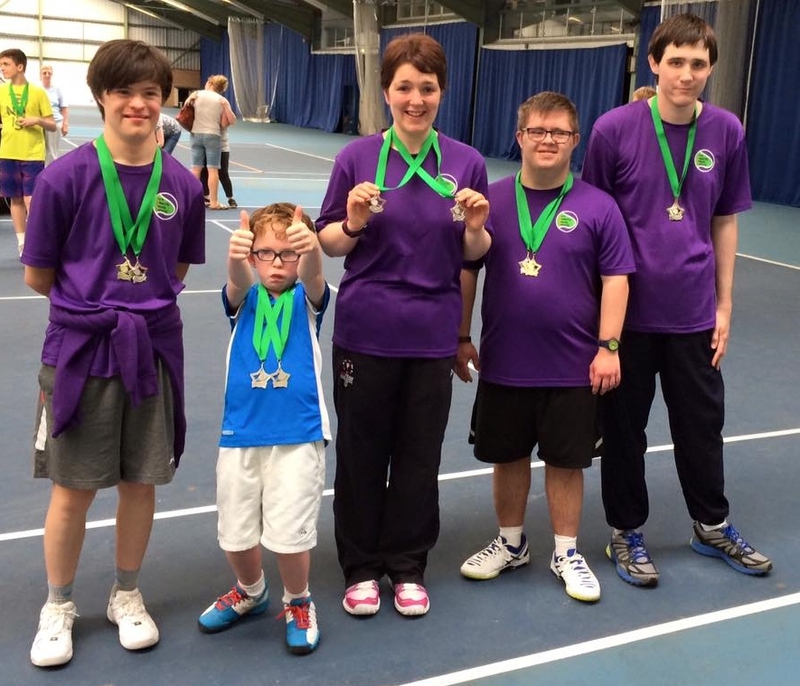 Laura and William both achieved Gold in the Singles, Cameron Silver and Matthew Bronze. Laura and Matthew won Gold in the Mixed Doubles and Cameron and William also won Gold in the Mens Doubles. A big congratulations to them all on such a fantastic achievement. On the weekend of 27th/28th May 2017 six players competed in the Learning Disability Regional Tennis Series Tournament held in Nottingham. They brought home 3 Gold Medals and 9 Silver medals between them. Congratulations to (pictured from left to right) William Farrow – Singles Silver, Doubles Gold (with Cameron), Sam Dale – Singles Silver, Doubles Silver (with Christopher), Laura Campbell – Singles Silver, Doubles Silver, Cameron Long – Singles Silver, Doubles Gold (with William), Christopher Cook – Singles Gold, Doubles Silver (with Sam) and Matthew Brough (not pictured) – Singles Silver, Doubles Silver. Well done to you all! For volunteers helping at sessions the following forms must be downloaded, completed and returned to the YDTN’s Head Coach Andy Crockett (not head office as it says on the forms). 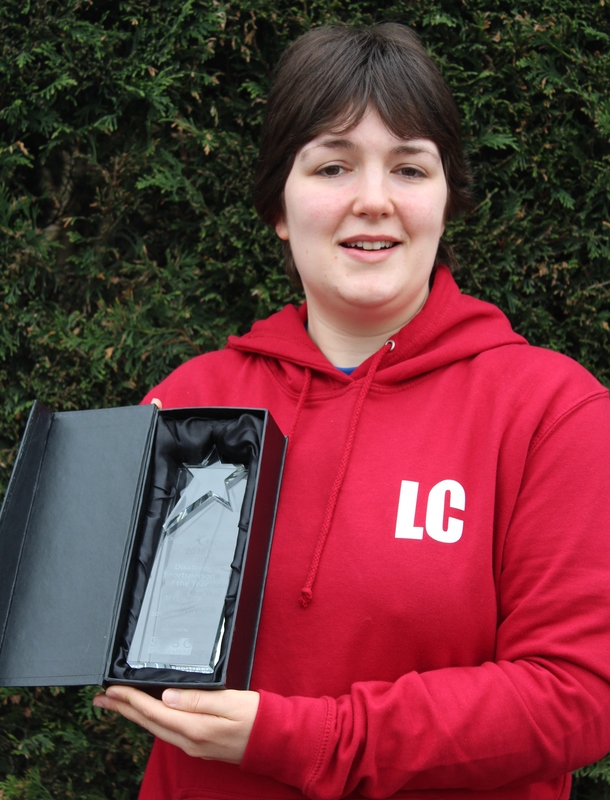 Congratulations go to Laura on becoming the Disability Sportsperson of the Year for the second year running at the Active York Sports Awards in March 2016. Laura Campbell is the first athlete from York to be selected for the Special Olympics World Games which took place in Los Angeles in Summer 2015. Laura won two gold medals in the Singles and the Mixed Doubles. 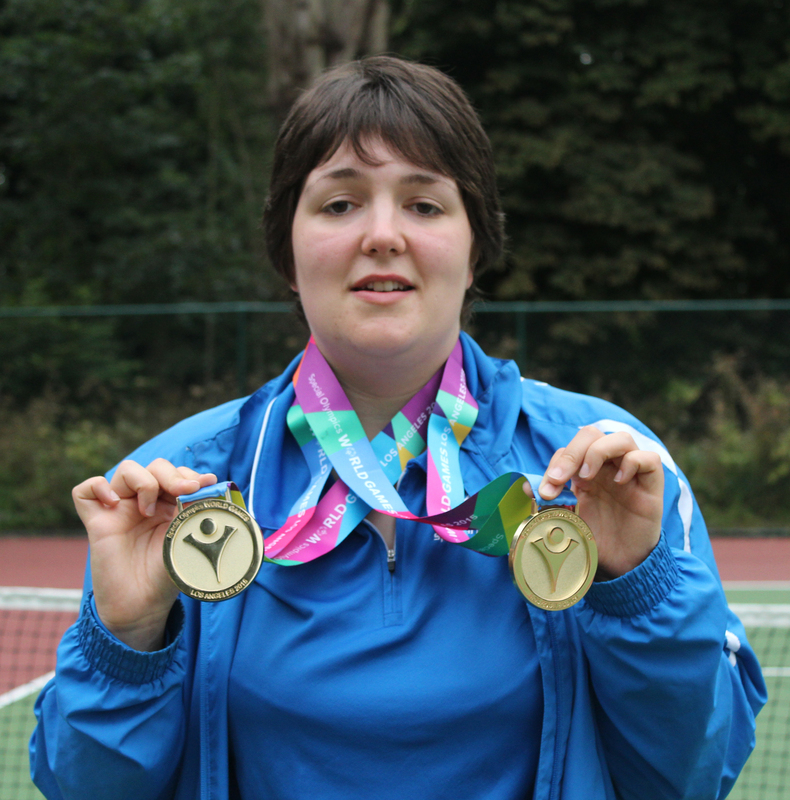 Laura is a keen tennis player and has competed in Special Olympics competitions both Nationally and Internationally. To read the Spotlight on Laura Campbell by the Tennis Foundation click on the image above.